I love this concept. Square trees! Another shining example of organizing the chaos of nature along more efficient industrial lines. (And no, I’m not talking about that public-radio April Fool’s piece you can find with a little Googling. This was 100 percent legit.) As so often happens, inertia and distractions delayed implementation, and the fellow who came up with the original concept has moved on to other things. So it’s time for the Teeming Millions to pick up the … eh, “torch” may not be the best metaphor when you’re talking about forests. Let’s just say there’s challenging work to be done. The genius behind the square tree was Robert Falls, who in the late 1980s was a PhD candidate in the University of British Columbia botany department. Falls noticed that some tree trunks exposed to high winds had become less round in cross section—they’d grown thicker on their leeward and windward sides to buttress themselves. Falls theorized that flexing of the bark by the wind encouraged the cambium—the layer of growth cells just beneath the bark—to produce extra wood. To test his theory, Falls subjected trees to what he thought might be comparable stress by scarring them with surgical tools. Sure enough, more wood grew at the site of the scars. Hearing the news, a professor in the university’s wood-science department suggested Falls try using this discovery to grow trees with a square cross section. Square trees would be a boon to the lumber industry. Since boards are flat and trees are round, only 55 to 60 percent of the average log can be sawed into lumber—the rest winds up getting turned into paper pulp and the like, or just gets thrown away. So Falls obligingly scarred seedlings of several species (western red cedar, black cottonwood and redwood) at 90-degree intervals around their trunks. The trees responded as hoped, becoming “unmistakably squarish,” he tells me. The beauty of the Falls system was its simplicity—despite what you remember hearing, no hormones were needed. Early attempts to produce square trees required growing them in square molds. Today, the Japanese can make a square cedar log out of a round one using a steam press. But these methods are resource-intensive. The Falls method merely required a little precision ripping and tearing. Square trees were just the start. 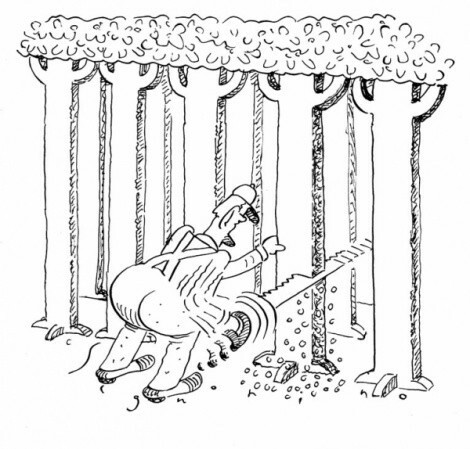 In 1989, Falls was awarded a Canadian patent for an “Expanded Wood Growing Process,” a bland title that fails to capture the revolutionary nature of the concept. Square trees by comparison are a mere novelty. The young scientist had come up with a way to grow boards. The logic was this: Conventional logging is wasteful and strips the land bare. It also destroys what’s arguably the most valuable part of the tree, namely the thin layer of cambium, which is what grows more wood. Falls solved all these problems. His approach to lumbering preserved the cambium, in simplest form by slicing open the tree, harvesting the mature wood in the center, and unrolling what was left—the cambium plus bark—into a more or less flat sheet. The roots would remain attached at the bottom, and the branches and leaves at the top, so the tree would continue to grow and the cambium would produce more wood, only in flat form. When the flat piece of wood got thick enough, you’d slice it off, like cutting a slice of bread from a loaf, and leave the tree to grow the next one. I grant you a forest of flat trees might look a little funky, but if you grew the trees hydroponically, you could leave the natural forests alone. Likewise, the most he managed to do with his board-growing technique was a bench-scale redwood. He says the process is best suited to making high-quality veneers. Board, veneers … let’s not quibble about semantics. The point is you can grow flat pieces of wood in the lab. Whether you can do so in the field, so to speak, remains to be demonstrated. That’s the challenge for some ambitious Straight Dope reader. I don’t care if the process is too complicated for mass production. I just want to live in a world where it’s been done.